Why is there a chair in the middle? I was about to take a bath. With my iced coffee. 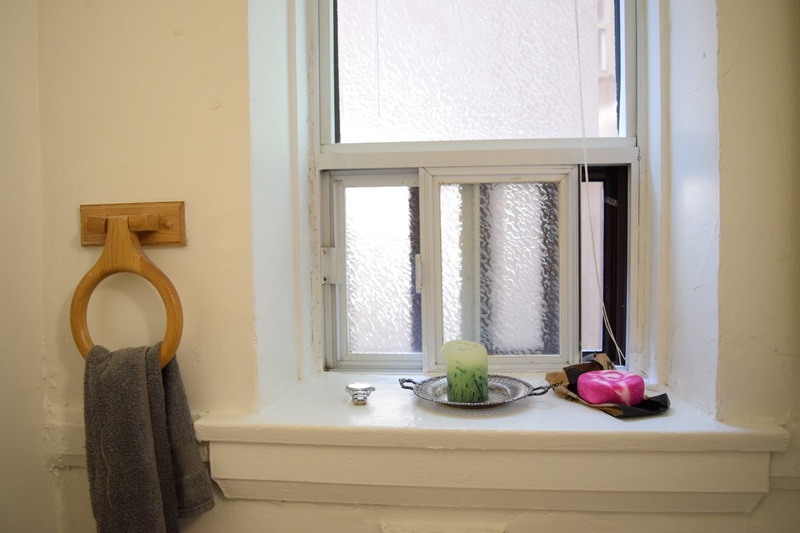 I love our adorable bathroom in our tiny apartment. There are definitely some weird things about it, like the haunted/murderer light (you switch the light on, and it’ll flicker on and off a few times before staying bright), the fact that Nic broke the towel bar (that’s the guest hand towel hanging on the loop, my face towels have to hide behind the tub), and the whole floor is slanted. 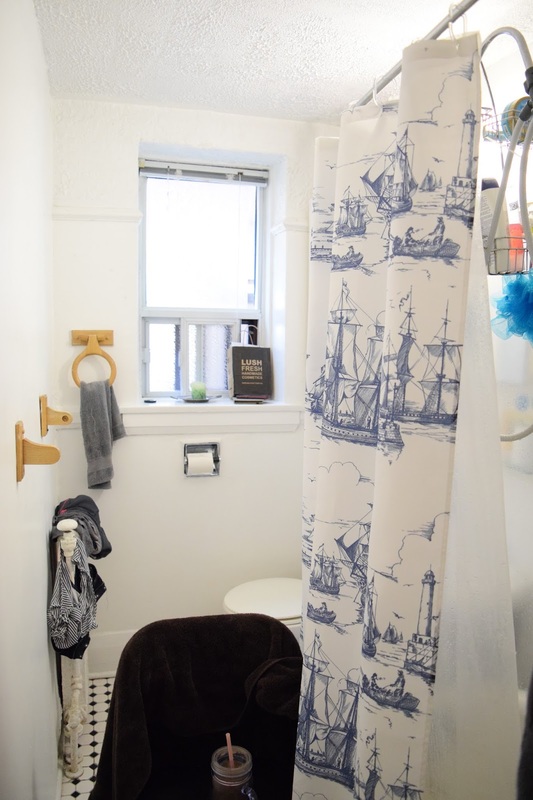 However, it’s functional, we have a clawfoot tub (a dream of mine, and I’m taking advantage of it for the time being, since they’re not the easiest to shower in), and it’s cute. 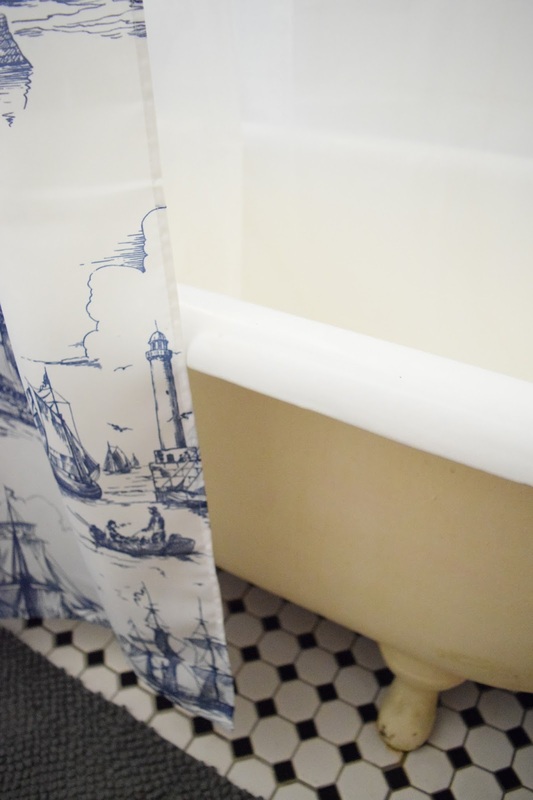 Adorable nautical shower curtain, tub, and tiles. Originally, I wanted to get IKEA’s Akerkulla curtain, to bring in colour, but it turned out it was too dark in person. We ended up going for Aggersund, which fits our colour scheme really well (navy and grey). We’ve gotten lots of great compliments on it so far, since it’s so pretty, but then still masculine. Lol. The sink doesn’t have much space, so I installed this cute glass shelf from IKEA (Grundtal). Lots of space for the enamelware mug and toothbrush holder, and the soap dish I found at various thrift stores. The awesome postcard of men in speedos was sent to me from my friend David, and it fits in with the theme of our bathroom. 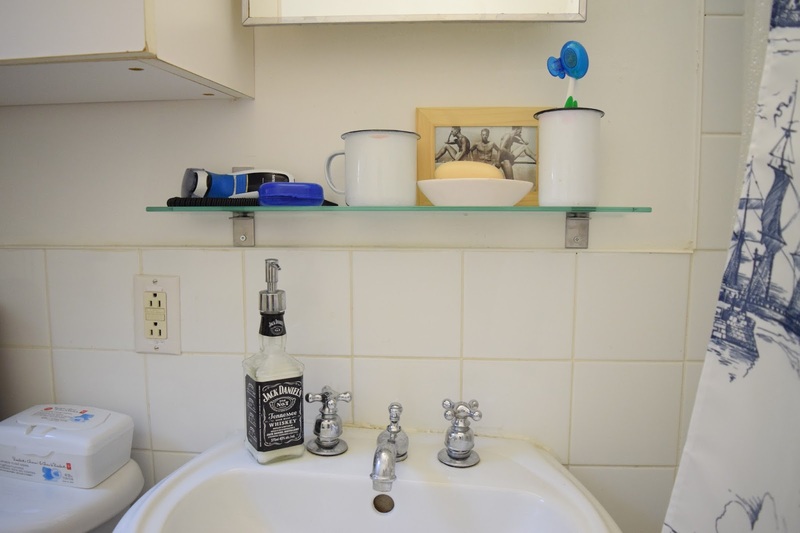 And check out that Jack Daniels soap dispenser Nic made for himself. Our apartment is on the first floor, and faces the alley where our building’s tenants lock up our bikes and the communal BBQ is. So you can make eye contact with people while you poop. To prevent that, I bought some contact paper from Home Depot. Wayyyy better. 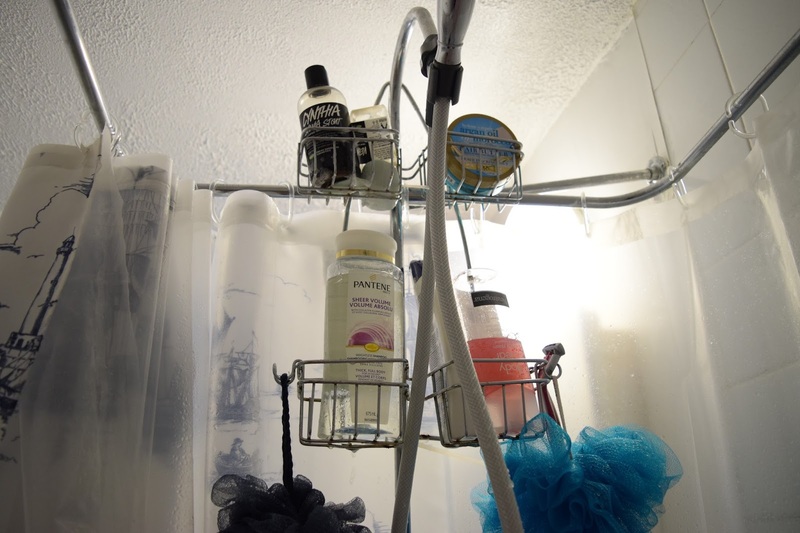 A previous tenant used zip ties to attach some shower caddies to the ceiling rack, which is aweosme, since otherwise it’d be hard to figure out where to store out stuff. Dinner at the Sea Witch – 2 months of marriage!